When I first began thinking over the idea of homeschooling a friend sat my husband and I down. She went over a wealth of information. One of the best parts was getting a chance to look over curriculum. She had homeschooled for many years and had pulled some of the best from many styles. As I now talk to new prospective homeschooling moms this is one area I see holding back parents from taking the plunge. They worry about what to use and where will they get it. First off let me address where to get your curriculum. There are many places. 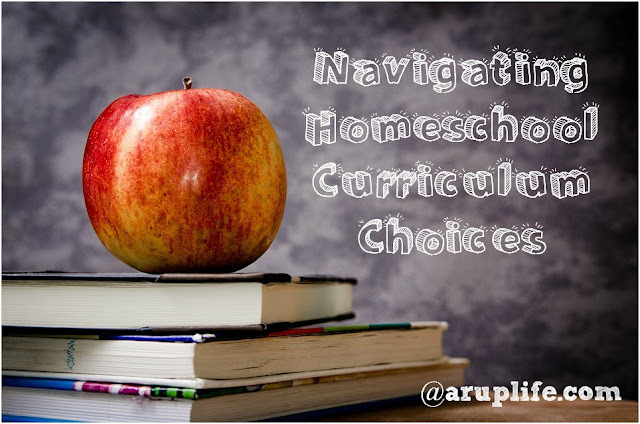 Almost all homeschooling curriculum companies have their own website you can order directly from. You can also purchase at websites like ChristianBook.com or RainbowResources - they have pretty much every popular curriculum for sale all at one location which can be extremely nice when it comes to saving on shipping. If you go to convention most companies sign on as vendors. This is perhaps my favorite way to shop because you can touch, open and look at all the curriculum. Plus the vendors are there to ask questions directly and guide you with usage. Next we will discuss some of the groups of curriculum and I'll try to link to some examples. The main thing here when choosing is think about your teaching style and your child's learning style. Then try to find things that will fit both of you. This is really a bit of trial and error for most families so don't be disappointed if something doesn't work for you and you have to move on from it. Also what works for one kid might not work for another. This is curriculum that is heavy on reading. Science, history and English all have good books to read mixed in the learning. This is perfect for a child that always has their head in a book. The books weave all the learning with extras like worksheets and hands on activities. These would also fit well in the Charlotte Mason way of homeschooling. With these two you take an approach where you focus on one subject. For example if you wanted to study Dinosaurs you would do a set period of time focusing on just that subject. Books would be on Dinosaurs and even your spelling list would reflect that. Basically all subjects would be represented but they would be associated with the main theme. You can use this as a whole approach to learning or as supplemental. Distant learning is where you participate in a school setting by watching the teacher lecture. Classical Education is based on the Trivium - going through the three levels grammar, logic and rhetoric. There is a great book - The Well Trained Mind - which goes into what classical education is and how to teach it. Those are just a sampling of learning styles and curriculum that fit into those particular molds. There is also a bunch of independent curriculum that I consider truly awesome and worth mentioning.